One way to make some new friends is to join in a recreational sports league. If you aren't sure what to play or do not have experience playing sports, Dodgeball or Kickball are great activities for all levels and are so much fun, you will want to play again and again! Dodgeball is a game in which players try to hit other players on the opposing team with plastic covered foam balls while avoiding being hit themselves. There are many variations of the game, but generally the main objective of each team is to eliminate all members of the opposing team by hitting them with thrown balls, catching a ball thrown by a member of the opposing team, or forcing them to move outside the court boundaries when a ball is thrown at them. The term Dodgeball comes from a term referring to avoiding something or someone mildly unpleasant and can be referred to as 'playing dodgeball': the act of avoiding something or someone mildly unpleasant. The number of dodgeballs used in a game can vary but three to ten balls are common. Three is the minimum number of balls to conduct a game. Most dodgeballs are the size of a volleyball and are of foam material with a plastic outer shell. A typical dodgeball game is usually played on a basketball court, parking lot, tennis court or other fenced-in area. There is no fixed dodgeball court design. The court, however, must have a centerline to divide the teams' sides. At the beginning of a dodgeball game, the balls are lined up on the central dividing line. The players must rush toward the centerline simultaneously, try to grab one of the dodgeballs, and throw or roll it backward to their own teammates. This is known as the opening rush. You cannot pick up a ball and throw it instantly. Once the game has started, players throw balls at members of the opposing team in an attempt to eliminate players. When a player has been hit by a dodgeball on the full, meaning without hitting the roof, the floor or any walls, and no one catches it before the ball hits the ground, the player who was hit has been eliminated and must move off the court to his or her team's designated bench area. If a player catches a ball thrown by the opposing team on the full, then the player who threw the ball is eliminated, and the team that caught the ball can reinstate, or bring back a player that has been out the longest. The team that is able to get all of the players on the opposing team out first wins the game. There are many theories as to where the game originated. One theory is that the sport came from Akron, Ohio in 1920. Returning from the First World War, two men working in a factory came up with the unique game out of boredom. Soon it was picked up by the government and instituted into the physical education programs within schools. In 1978, Dr. John H. Dubois, a scientist and professor, created a material called Antanite, which was modeled into a ball to be used in a dodgeball game. By 1985, dodgeball was gaining popularity and amateur dodgeball leagues had surfaced all across America with some discussions of a professional team. In 1996, the International Olympic Committee recognized Dodgeball as a serious sport and the game was played internationally for the first time at the Olympic Summer Games in Atlanta, Georgia. After the first Olympics, a DodgeBall World Cup was established. Every four years teams from around the world would compete to earn the title of World Champion. Kickball is a playground game invented in the U.S. in the first half of the 20th century. 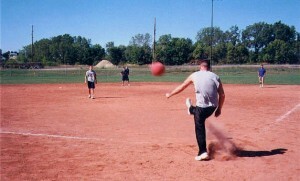 Kickball was originally called Kick Baseball and was invented around 1917 by Nicholas C. Suess, Supervisor of Cincinnati Park Playgrounds in Ohio. Around 1920-1921, physical education teachers in public schools used kickball to teach boys and girls the basics of baseball. The game is similar to baseball where players kick an inflated rubber ball instead of using bats and baseballs. As in baseball, kickball teams alternate innings with one team on the infield attempting to score by having its players circle the bases and the other team in the outfield working to stop runs from being scored. Players in the infield kick the ball that is "pitched" to them by the opposing team in order to advance players around the bases. If you are in the outfield, you can get players out by throwing the ball to a baseman before the runner gets on base or also by catching the ball midair from the kick. You can also tag a player with the ball to get them out. The team with the most runs after 9 innings wins the game. If you are interested in playing some Dodgeball or Kickball, search for some recreational leagues in your area! www.ZogSports.com has a Dodgeball league in NYC, NJ, DC, CT and Atlanta. If you are in the NYC area you can also check out NYC Social Sports League http://www.nycsocialsportsclub.com/ for weekly Dodgeball or Kickball games. If you're in Boston check out Boston's BSSC league. If you're located in Miami check out Miami's Sports and Social Club. If you're in LA, check out some sports leagues here. This is also a great way to meet people in your area and make new friends!